Knowledge is power – especially when it comes to electricity. And as Illinois’ biggest electric utility installs four million new digital, advanced meters across the state, people are on the brink of obtaining the intelligence they need to maximize the benefits of this smart grid technology. The Citizens Utility Board (CUB) and Environmental Defense Fund (EDF) have brokered an agreement with Commonwealth Edison (ComEd) that could catapult Illinois to the national forefront in providing households with real-time data on their electricity use. The deal is part of the “Open Data Access Framework” for protecting, collecting, and sharing energy-use data, which has recently gained ground but is still awaiting final approval from the Illinois Commerce Commission (ICC). About two years after CUB and EDF asked the ICC to institute the framework, we’re pleased ComEd has embraced using the national “Green Button Connect” standard for third-party data access. We hope this watershed agreement leads to a surge in innovations that help people reap the full savings potential of the smart grid. 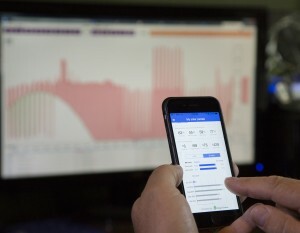 As a result of the arrangement, ComEd will now furnish its customers with actual and easily digestible information on their energy use in nearly real-time fashion. Under the new standards, people will be able to access the data on the Internet within an hour of using the electricity – and directly on their advanced meters within just 60 seconds. Armed with this data, people can more effectively monitor and lower electricity costs on their own—or let third parties (think revolutionary new smartphone apps) do it for them. For instance, the data will help customers keep attuned to hourly fluctuations in energy prices, allowing them to be more nimble at adjusting their habits at home to dodge the most expensive periods of the day. Or they might use an app that sends notifications to help them reduce energy use and save money during periods of high demand. This is where the smart grid can produce its biggest rewards for customers, but the opportunity is contingent on the kind of information access embodied in the Open Data Access Framework. Of course, user privacy is sacrosanct. By designating ComEd customers as the controller of their own data, the proposal scrupulously upholds security. At the same time, it gives them the prerogative to securely share their data if they want to capitalize on savings opportunities. In addition to opening the door to smarter energy choices, the agreement with ComEd represents an important milestone in efforts to unleash the money-saving promise of Illinois’ emerging smart grid. Advancements like this exemplify why our organizations believe the smart grid – as long as it is coupled with careful regulatory oversight and accountability – is a wise investment for Illinoisans. This entry was posted in Clean Energy, Data Access, Illinois and tagged Data. Bookmark the permalink. Both comments and trackbacks are currently closed.